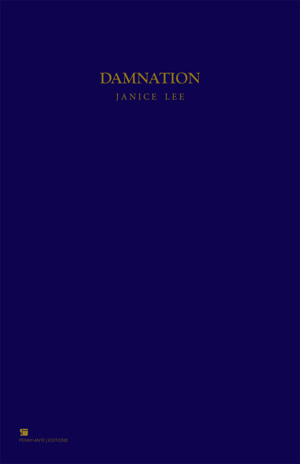 Damnation, Janice Lee’s fourth book, pays homage to the films of Hungarian director Béla Tarr, as well as the novels of László Krasznahorkai, upon which the films cited here are based. The book most closely references the films Kárhozat (Damnation, 1988), Sátántangó (1994), The Werckmeister Harmonies (2000), and A torinói ló (The Turin Horse, 2011); but it could be said to reproduce, obsessively and interrogatively, the worldview of Tarr’s entire oeuvre and the cinematic strategies used to describe it. These films propose a grim determinism, an ever-churning system of ordered hopelessness. Characters, often nameless, exist within unflinchingly punishing conditions, most clearly exemplified by the roaring, pummeling wind that confronts them at all turns. It’s not so much the hopelessness of their situation that is so captivating, but the characters’ unswervingly persevering response to it, a perseverance reflected in Tarr’s famously enduring long takes, which are, likewise, simultaneously brutal and quite spellbinding to experience. Tarr’s use of long takes is also strongly intimate, and Lee takes up this intimacy in quintessentially literary fashion: through an exploration of subjectivity. The book is structured in a series of discontinuous vignettes, some extending across several pages, others existing as short bursts of language. Each of these vignettes, or “shots,” is relatively short compared to Tarr’s long takes, but in the tension between their density and expansiveness, time stretches; while the act of reading them does not take long, exactly, the experience is one of duration. Like Tarr’s films, Damnation is a meditation on time and the human condition, particularly human endurance in the face of repetitive drudge. The book repeats the bleak determinism of its source texts, even as the narrative declares, “You will see that I am a better God.” What is meant by “better” is, like so much in this book, frighteningly uncertain. Damnation’s loose plot begins with the arrival of a mysterious book. Described as “a strange looking copy of The Holy Bible,” the book inexplicably pollutes everyone who comes into contact with it: upon opening the book, the mail sorter experiences “a sudden sense of wretched misery”; children begin reciting bible passages in their sleep; villagers stuff their ears with wax to drown out the words. Lee’s book similarly pollutes its reader: haunting the consciousness with an eerily soothing murmur. It also pollutes Tarr’s narratives, infecting them with a particularly literary interiority. There is a dream sequence, for instance; an extended, fragmented flashback to a character’s childhood; a list of forty-six experiences a character observes he will never experience again. While many vignettes are strictly descriptive or strictly dialogue, these regular entrances into consciousness allow Lee to explore subjectivity in a way that the films do not, stretching time as she does so: another kind of long take. In some ways, Lee’s project could be seen as a reparative version of Tarr’s worldview. In layering these different scenes together, Damnation seeks to question and perhaps to repair the brutal worldview it brings into stark focus. Here the promise of spring is less a tease and more a reality: we observe a small snail moving across the road, its “glistening trail…offer[ing] a slight glimmer of hope.” Despite this cautious optimism, the narrative proceeds with a riveting uncertainty, as if the book itself exists in a kind of limbo. Fitting, then, that this scene and many others are populated with dogs—and, elsewhere, horses. Both animals figure in myth as psychopomps, guides leading one from life to death or back again. “Why were we only made to die?” a nameless character asks. Not only narrative, but life itself is a liminal experience, the book suggests, an in-between stage, taking up time between beginning and end. The point you realize there are no gods, no good or evil, just man and man’s own judgment. The moment you notice that the wind has started up again and the moment when you realize the wind has never and never will stop. The point when one pattern overtakes another. Characters in this vaguely Sisyphean narrative are relegated to moving through their featureless days, day after day after day. “How long are we to wait?” a character asks her sister. “A little while longer,” the sister replies. Damnation isn’t pending—it’s already here. Damnation puts pressure on narrative’s status as a teleological form, using time, its simultaneously endless and durational properties, to do so. In this sense, Lee presents narrative theory in the form of eschatology. To reject eternity, narrative must drive toward an end point, typically in the form of redemption—or apocalypse. As Jon Wagner observes in his introductory essay, Lee gives us neither. At the end of The Turin Horse, Tarr’s self-declared final film, the lamp goes out; there is only darkness. The last lines in this book declare, “It began with the darkness.” The darkness, then, signals another beginning, but of what, we don’t know. When I look up from these pages, I hear the wind. Outside, it is raining.